CHICAGO (July 9, 2014) – Registration is now open for H.H. Backer Associates, Inc.’s Total Pet Expo 2014 Fall Trade Show. 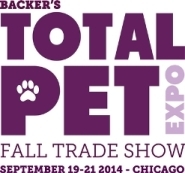 Backer’s Total Pet Expo runs September 19-21, 2014, at the Donald E. Stephens Convention Center in Rosemont (Chicago), Ill. The show features exhibitors from around the world displaying dog, cat, bird, aquatic, reptile and small animal products and services for a diverse buying audience. Buyers include pet stores, groomers, kennel operators, boutique/specialty gift stores, hardware stores, big box stores, mail order catalogs, online stores and distributors. This year, H. H. Backer is excited to announce that Hall A in the convention center will be the new home of the show. Previously held in Halls F and G, on two different levels connected by escalator, the new Total Pet Expo space allows the entire show to be on one level. Another exciting change this year is a new show app. The app—for smartphones and tablets—includes exhibitor and attendee locators, schedules, speaker bios, maps, a QR scanner, photo gallery, social media links and Click, an interactive scavenger hunt game/contest. The app can be found at iTunes and Google Play (search “Total Pet Expo”) or by entering the following URL directly into the web browser of any Android or Apple phones/tablets: https://crowd.cc/s/2SE4. Backer’s Fall 2014 Total Pet Expo will also include the following specialty areas: the Product Innovation Area, the Pet Store on the Floor, the Smart Zone Education Stations, the New Exhibitor Area, the All-Natural Area, the Idea Wall, and the Celebration of Style Grooming Competition. From an education perspective, Backer’s Total Pet Expo courses will be led by renowned industry experts. Free “Smart Zone” Education Stations, located on the show floor, will feature a variety of experts in comfortable, conference-style settings. Five different tracks will be offered: Technology, Business Management, Marketing and Merchandising, Aquatics and Animal Health and Wellness. Also, a full day pre-show seminar, “The Nuts and Bolts of Bigger Retail Profits” will be led by Chris Beykirch on Thursday, September 18, from 10 a.m. to 5 p.m. Complete show information, including details on booking a booth, advance registration for free badges (buyers and media) and a detailed list of educational sessions/sign-up information can be found at www.totalpetexpo.com. Backer’s 2013 Total Pet Expo Show drew 408 exhibitors in 693 booths and more than 6,500 retail buyers from around the world. Fairchild expects increased attendance at this year’s event, which is the only Midwest-based pet industry trade show. For more than 40 years, H.H. Backer Associates Inc. has been at the forefront of the pet industry with its record-breaking trade shows and educational conferences. As a highly respected and progressive force in the constantly evolving pet industry, H.H. Backer Associates Inc. delivers quality buyers and quality results at its annual Total Pet Expo. For more information, please visit www.totalpetexpo.com or call 312-578-1818. Connect with H.H. Backer Associates on Facebook (search for “H.H. Backer”) and Twitter (@TotalPetExpo).